local press inviting tenders for the building work. The designs were by Thomas Browne, Scotland’s leading prison architect and they incorporated all the latest thinking. As the Stirling Observer reported the following week, on the morning of Thursday 11 Nov 1847 the prisoners were finally escorted across St John Street, from the old Tolbooth Jail to the new jail where they found a contrast in philosophies as much as in architecture. Unlike the old Tolbooth, where many cells opened directly onto the street, the new prison was isolated behind its own curtain wall so that communication was entirely prevented. Its massive, castle-like construction was no mere fashion statement but emphasised its strength and power. Internally, the central tower allowed staff to supervise the two wings at all levels. Cell floors are a little below those of the corridors, so any spills would be contained. Work spaces were central; exercise areas on the roof allowed prisoners fresh air without any contact with the outside world. Staff (male and female) were trained and were expected to assist in the process of reform. Male and female prisoners were strictly segregated, indeed, met other prisoners only at work or exercise. Every aspect of the prisoner’s life was regulated and controlled so that even the fresh air was prison air, the silence was prison silence, the diet was scientifically calculated to provide just enough nourishment – but to be as boring as possible. The historical sources for the prison are good. Apart from the official Reports of the Inspectors of Prisons, these include census returns (which list staff as well as prisoners) and the Governor’s Journal. Press reports of trials give brief biographies of some of those sentenced to Stirling Jail and, on 5th Sept 1867 (p. 4-5) the Stirling Observer published a ‘Diary of Two Months in Stirling Prison’ written by a male prisoner after his release. Over the decades, as fashions changed, the regime was varied. Some of the new ideas would have been anathema to Brebner and Hill, particularly devices such as crank machines, which forced prisoners to work hard at consciously useless but carefully-measured tasks, each prisoner to complete their allotted quota of uselessness, each day. By the 1880s, as railways made it easier to move prisoners, it was apparent that fewer, larger prisons would be more economical. The Army, itself trying to mitigate its previously savage punishment regimes, which had made recruitment increasingly difficult, took over the Stirling Prison for use as the main Detention Barracks for Scotland. The £2000 compensation received paid for new police cells to hold civilian prisoners locally for short periods. 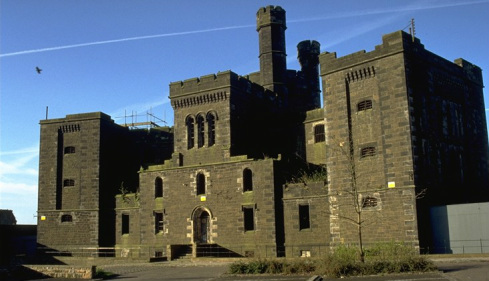 The army retained the building till 1935 and it is still sometimes called the Military Prison. After a period of dereliction the former jail became a tourist attraction and offices in 1996 with the new name of Stirling Old Town Jail (Stirling Observer, 27 March 1996 p.1) There are now displays on the prison reform movement, Hill and Brebner and the use of the building as a prison 1847-1935. Stirling Prison Governor’s Journal 1857-1886; National Archives of Scotland HH12/83/1. Andrew Coyle, 1991. Inside; Rethinking Scotland’s Prisons, Edinburgh. Has useful information about William Brebner and Frederick Hill. Frederick Hill (with Constance Hill), 1894. An Autobiography of Fifty Years in Times of Reform, London. Reports of the Inspector of Prisons in Scotland (1836). Stirling Observer – The Stirling Observer and other local newspapers are available in Stirling Central Library and in Stirling Council Archives.